The Congress of Ghosts (available as Kindle Edition eBook) is an anniversary celebration for 2010. It is an historical biography, that celebrates the 5th year online of www.dmairfield.org and the 10th year of effort on the project dedicated to analyze and exhibit the history embodied in the Register of the Davis-Monthan Airfield, Tucson, AZ. This book includes over thirty people, aircraft and events that swirled through Tucson between 1925 and 1936. It includes across 277 pages previously unpublished photographs and texts, and facsimiles of personal letters, diaries and military orders. Order your copy at the link. Military Aircraft of the Davis Monthan Register, 1925-1936 (available in paperback) at the link. This book describes and illustrates with black & white photographs the majority of military aircraft that landed at the Davis-Monthan Airfield between 1925 and 1936. The book includes biographies of some of the pilots who flew the aircraft to Tucson as well as extensive listings of all the pilots and airplanes. Use this FORM to order a copy signed by the author, while supplies last. Art Goebel's Own Story (available as free PDF download) by Art Goebel (edited by G.W. Hyatt) is written in language that expands for us his life as a Golden Age aviation entrepreneur, who used his aviation exploits to build a business around his passion. Available as a free download at the link. Winners' Viewpoints: The Great 1927 Trans-Pacific Dole Race (available as Kindle Edition eBook) is available at the link. This book describes and illustrates with black & white photographs the majority of military aircraft that landed at the Davis-Monthan Airfield between 1925 and 1936. The book includes biographies of some of the pilots who flew the aircraft to Tucson as well as extensive listings of all the pilots and airplanes. Use this FORM to order a copy signed by the author, while supplies last. Clover Field: The first Century of Aviation in the Golden State (available in paperback & Kindle Edition) With the 100th anniversary in 2017 of the use of Clover Field as a place to land aircraft in Santa Monica, this book celebrates that use by exploring some of the people and aircraft that made the airport great. 281 pages, black & white photographs. Underwood, John. 2006. Images of Aviation: Grand Central Air Terminal. Arcadia Publishing, San Francisco, CA. 127 pp. ISBN: 0-7385-4682-8. You'll note on this site, and all the sites of the suite tabulated at right, that I present BIOGRAPHIES of people relevant to the Registers. For the information on airplanes, I present what I call TECHNOGRAPHIES, which I use to mean a "biography" for a piece of technology. If you look up the definition of technography, it has a different meaning than what I have chosen it to connote. I apologize in advance to the lexicographers who visit my sites. I'm looking for information and photographs of the Grand Central Air Terminal to include on this page. If you have some you'd like to share, please click this FORM to contact me. Likewise, if you know the location(s) of other Airfield Registers, please let me know. You have chosen to enter the suite via the Grand Central Air Terminal, Glendale, CA (GCAT). Spend some time here by clicking any or all of the navigation buttons at the top and right of any page. When you are finished, you may come back here by clicking HOME and direct your browser to the other sites tabulated, summarized and linked from the travel hub table below. In aggregate, these Registers recorded flight activity around the United States from 1925 to 1942. GCAT has a glamorous and enrolling history. 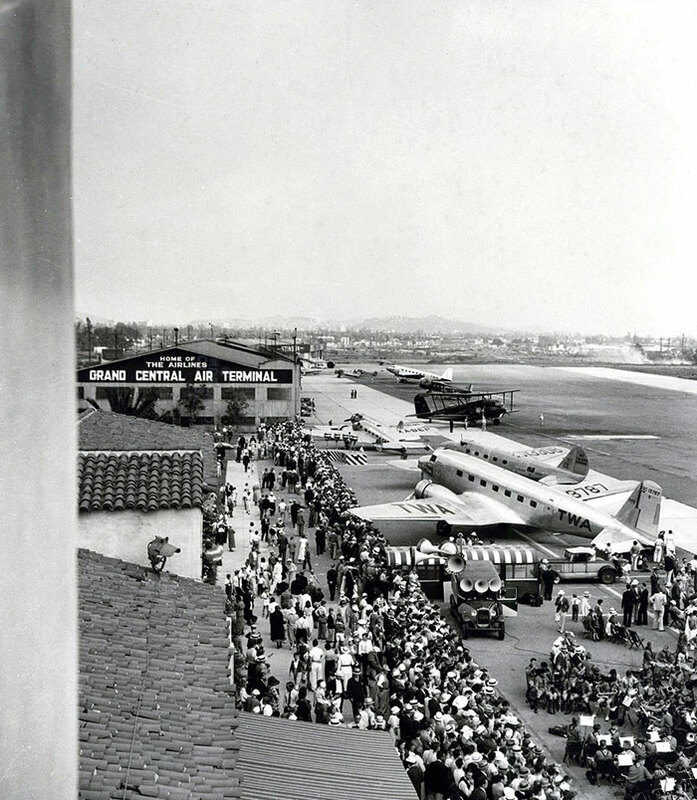 It became an official airport entity as Glendale Municipal Airport on March 17, 1923. 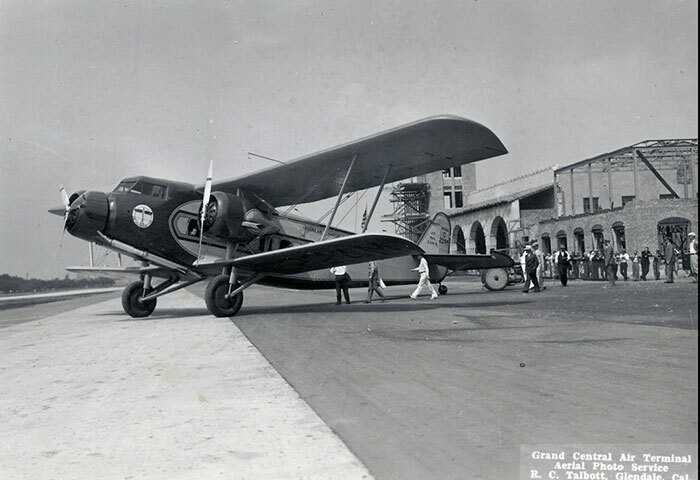 It was given a name change of Grand Central Air Terminal and rededicated February 22, 1929. The beautiful terminal building (see below) was under construction, about half-way completed, at the time of the 1929 dedication. 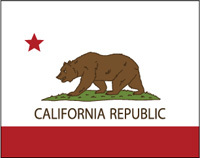 It was one of 143 landing fields in the state of California at the time. The small filler article from Aeronautics magazine, December, 1929, right, provides background. For 30 years GCAT hosted scheduled air transport companies, record setters, local industries, famous aircraft and famous people in and out of aviation. A good resource, which includes many period photographs, including the terminal building under construction, is John Underwood's informative book, cited in the left sidebar. Please note, while GCAT was an airfield from 1923 to 1959 (see below), the dates you see in the banner above are the dates that the known REGISTER was kept at the field. Excellent photographs and information about the old Grand Central Air Terminal are at the Davis-Monthan Airfield Web site at the link. At the link, near the bottom of the page, you'll find videos of GCAT. The videos are excellent in that they flow back and forth between modern views of the Terminal and views from the 30 years of its life between February 22, 1929 and July 15, 1959. Image, above, from this REFERENCE. 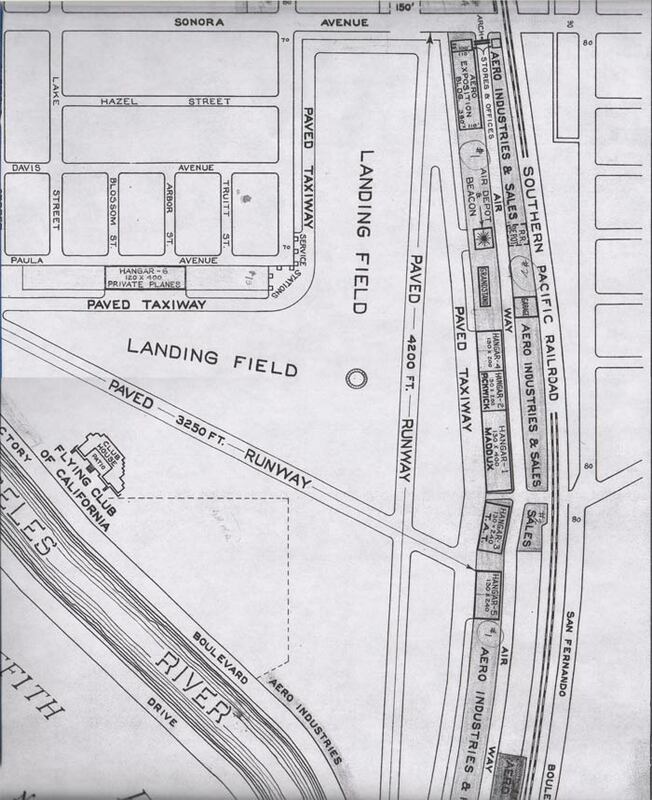 The location of the original Grand Central Air Terminal is today a light industrial and residential area. Nothing is left of the original runway. The terminal building, however, still exists (see below) in its Spanish Colonial Revival and Art Deco grandeur. In 2013, plans were set to restore the building to its original configuration (more or less) when it was an airfield terminal. The link takes you to a blog that describes the plans (with drawings). The restoration is now complete and a Flickr stream of progress as of Fall, 2015 is at the link. Please notice and follow some of the other links from the blog page. From those and the information I present below, you will cheer this restoration. As of February, 2016, the GCAT, as restored by the Walt Disney Company, is now open for visitors. If you are a fan of aviation history, a visit to the restored GCAT is a must if you travel to Los Angeles. In 2002, the existing terminal building was the subject of a National Park Service (Western Region), U.S. Department of the Interior, Historic American Buildings Survey. A report was written that is available for download at the link (PDF 377kB). This 26-page report gives insight into the architecture and use of the building throughout its history. 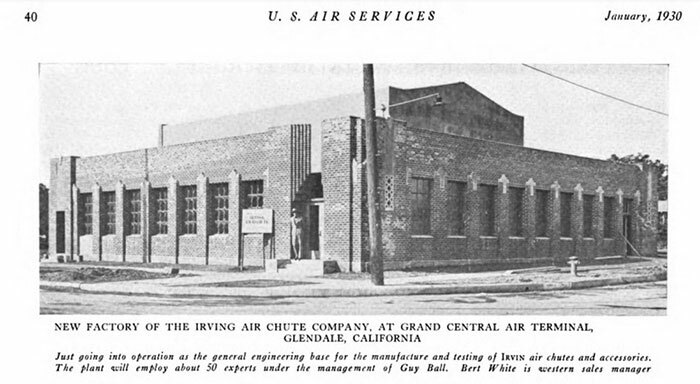 Further, a Web site, titled "Grand Central Air Terminal," was built by the Glendale Public Library around this report (texts from the report were incorporated into the site) and photographs were added, as well as a few other amenities. As well, the Library of Congress holds a group of very nice contemporary, black & white, 4" x 5" photographs of the exterior and interior of the Terminal. These photographs appear to have been taken in conjuction with the 2002 Historic American Buildings Survey, since they are marked with "HABS." If you are a fan of GCAT &/or historic buildings both the downloaded report and all the Web site links are worth taking some time to study. WHAT AIRFIELDS & REGISTERS CAN BE INVESTIGATED? Please refer to the table below. Each interactive site stands alone. Each is crafted as an attractive and engaging exposition of 20th century aviation history. However, important linkages are made among the sites. You will delight in discovering the overlap in the movements of people and aircraft from Airfield to Airfield, across the United States. The linkages clearly reveal the patterns of air traffic and, more broadly, the evolution of civil, commercial and military aviation in the United States during what historians call the Golden Age of Flight, nominally between the years 1920 and 1940. The dates in the page banner, above, are the known dates that the GCAT Register was open and active. These dates are not the period that the airport was open to use. GCAT actually closed in 1959. WHAT IS AN AIRFIELD REGISTER? Circa 1926, as part of the effort to regulate the growth of air travel, the federal government issued a guideline to airport managers asking that a log be kept of traffic through their ports. At right is a copy of that guideline. An Airfield Register was most times a large, formatted book in which visiting pilots and passengers wrote their names, the registration numbers of their airplanes, their intended destinations, where they came from, the date and time, and perhaps some remarks. Such books lay open on desks and tables in airport offices and hangars around the United States during the Golden Age. Indeed, many airports today still have Registers open and available for general aviation pilots and passengers to sign. 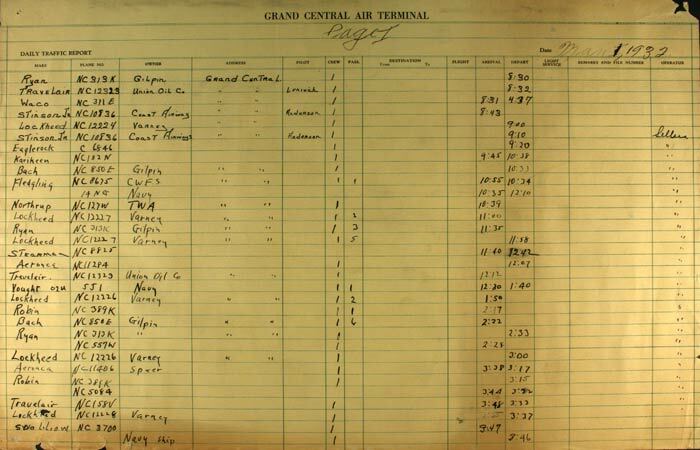 WHAT IS THE GRAND CENTRAL AIR TERMINAL REGISTER? The GCAT Register was an approximately 11 by 14 inch, two-hole looseleaf book. The book lay open at least from December 14, 1930 to November 28, 1935; a total of 1,810 days. Since I placed this Web site online, other Register pages have come to light and I noted them for you, below. If you know of other repositories for GCAT Register pages besides the ones listed below, please let me KNOW. You may view each of its pages at the REGISTER button at upper right. The GCAT Register was ruled into rows and columns with headers across a single large page that specified the information to be entered. Below, an image of part of the top half of page one with data for December 14, 1930 showing records 1-31. If the handwriting looks uniform to you, you are correct. 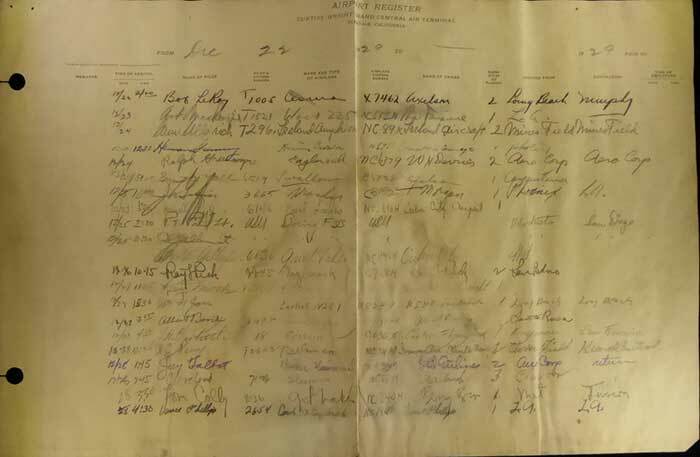 Unlike other Registers in the suite, most of the GCAT Register was not signed by the pilots. Rather, the information was entered by a series of tower Operators, some of whom identified themselves in the right column of the Register. On this page, the Operator's name was "Lygum." He was Anton Joseph Lygum. If you have photographs or more information about him, please let me KNOW. He, and his fellow operators appear in the Register hundreds of times. 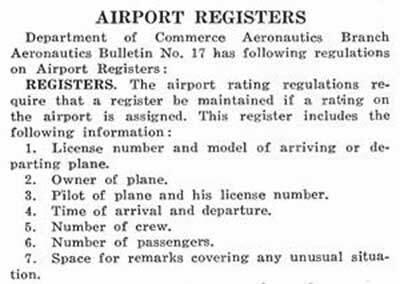 While having the Register filled in by operators was good from a readability standpoint (operators usually had neat handwriting and printed or typed the pages), it was bad from the pilot identification standpoint. 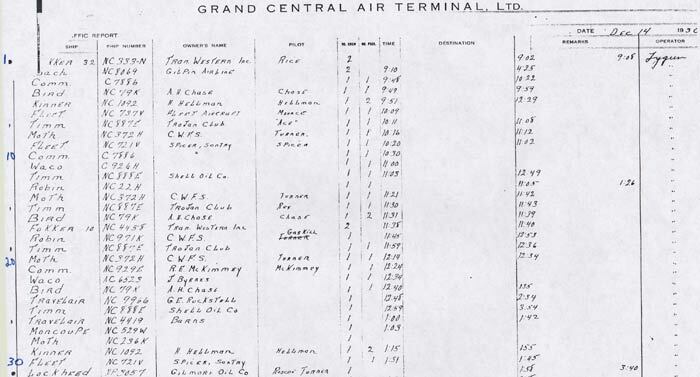 Of all the Registers, GCAT had the least number of pilots identified (note the blanks in the pilot columns above and below). The good news is that almost all of the aircraft registration numbers were entered, and times were logged meticulously to the minute (although sometimes it was difficult to tell if the time was for an arrival or a departure). And, if pilots were not identified, the owners of the aircraft were generally logged. Owners ranged from individuals (J. Byrnes, A.H. Chase, etc.) to flying clubs (Trojan Club, etc. ), to corporate (Shell Oil, TWA, etc.). NOTE: as of the upload date of this page, I can't tell you exactly how many pages or individual landing records there are in the Register. The explanation is that I have not finished entering all the data into the database that drives the site. On June 13, 2013, I uploaded 1,550 records entered across 59 Register pages. As of October 1, 2015, the Web site database now contains 2,937 records covering 102 pages of the Register. It takes a couple of hours or more of Webmaster effort to transcribe each page. There are probably close to 2,000 pages and maybe 30 or 40,000 records, so it will take me a couple of years to interpret and transcribe them all. Meantime, please follow my progress which I will announce periodically at the What's New on the Site? page, and, above all, please have patience. The majority of your Webmaster’s copy of the GCAT Register pages was acquired in 2009. Many thanks to John Underwood for sharing his copies of individual pages. We spent an afternoon at a popular stationery supply store photocopier. The first page from that work is exhibited above. Thanks also to the Glendale Public Library (GPL) for allowing me to take over a room for three days in 2009 with my copy stand and camera while I photographed the 629 pages of the original Register they hold in their archives. The GPL catalog call information for the box containing the original leaves is at right. Below, a page of the original Register from May 1, 1932 on yellow paper held by the Library. The Operator's name was Sellers. If you have information about Sellers, please let me KNOW. Another store of Register pages was discovered by the Walt Disney Company during the restoration of the Terminal building in 2015 (see below). These pages were stuffed in the ceiling of the tower cupola. Most important, though, is a gratifying example of inter-company cooperation. The Walt Disney Company has shared with Delta Mike Airfield, Inc. high-quality images of their pages for you to enjoy. Their 212 pages run from August 12, 1934 to November 28, 1935 and fill in many of the gaps in the Register pages already gathered for this Web site. The first page of the Disney cache is shown below, courtesy of the Walt Disney Company. Please notice the watermark in the lower right corner of each Disney page. Notice, too, one of the tower Operators was named B. Wranitzky. If you have information about Wranitzky, please let me KNOW. UPDATE OF APRIL 16, 2017 Another original Register page appeared for sale online. An image, below, was made available to us courtesy of "The Written Word Autographs." A significant pilot was James H. Doolittle who signed six lines from the bottom. He landed December 27th flying the Cessna DC-6B NC630K. Notice this page extends coverage of the Register back to December 22-28, 1929, a full year earlier than all other pages. And the columns are not printed in the same format as the other, later, pages. As well, there was no space for an operator to sign and, importantly, the pilots signed the Register themselves. The handwriting was their own. I do not know when access to the Register was transitioned from the pilots to the operators. The other side of this page dates from December 30, 1929-January 12, 1930 and is barely readable. As you work through the Register, you'll be able to tell which images are originals from the Library archives and from the Disney find, because they were all written on yellow journal paper. The ones that are photocopied are black & white. 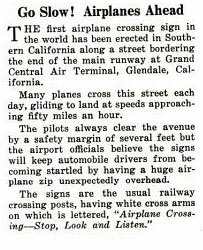 Regardless of the source, the generosity of their providers allows us to learn about and to build upon our knowledge of the colossal role Glendale played during the Golden Age of Aviation. WHAT WAS THE GRAND CENTRAL AIR TERMINAL? GCAT was an early hub of air transport and private flying in the Los Angeles area. The rededication on February 22, 1929 put the "Grand" in Grand Central Air Terminal. 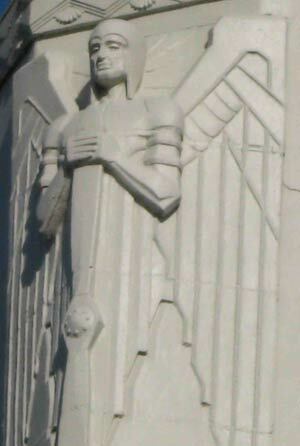 Each corner of the control tower was embellished with a Deco-themed, winged pilot, who, with flying helmet and propeller, stood guard to the points of the compass. One of them stands right. The terminal building (which was not complete when the airfield was rededicated) was a masterpiece of Art Deco design, constructed under the guidance of the architect and engineer Henry L. Gogerty (1894-1990). His firm was cited on the architectural drawings, below. Below is an image of the terminal building before it was completed in the late 1920s. The airplane is a Boeing trimotor Model 80, NC224M (not a Register airplane). 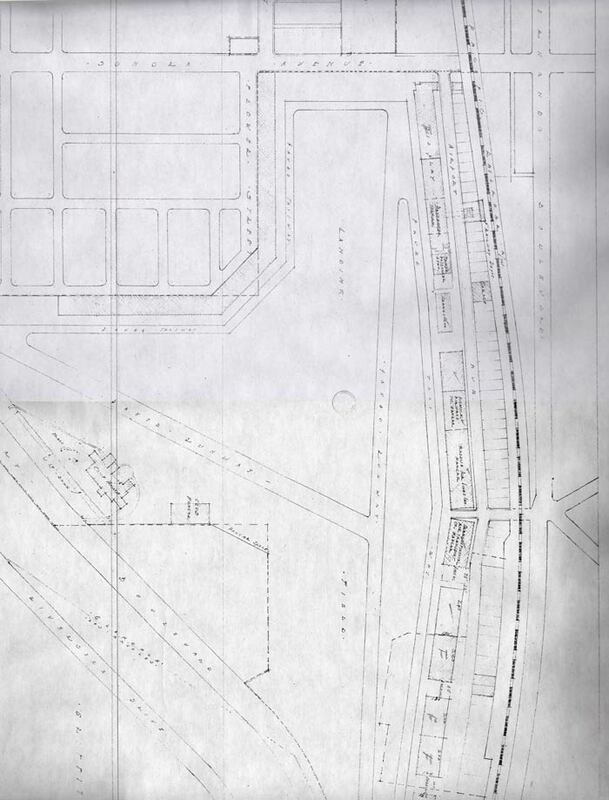 Below, from the original blueprint set for the terminal, are several small views of the property and building plan. As we view them, let's keep in mind these blueprints were produced by hand, in a day before computer-aided design. The 29 individual sheets are too large to exhibit, but I have captured a few vignettes to give you an appreciation of the details. Many of the 36" x 48" sheets are embellished with penciled notes by persons unknown, but not forgotten, because, as mentioned above, the GCAT has been restored by the Walt Disney Company and is now open for visitors (see photographs below). The copy of the blueprint set in your Webmaster's possession is courtesy of Ron Dickson, who specialized in the aviation history of the San Fernando Valley. At his link you'll find a page dedicated to GCAT. Unfortunately, Mr. Dickson passed away in 2015. His marker from the Portal of Folded Wings in Los Angeles is at the right. First, I present a series of three images that track the development of the drawing set. The first is the basic survey from November, 1928. 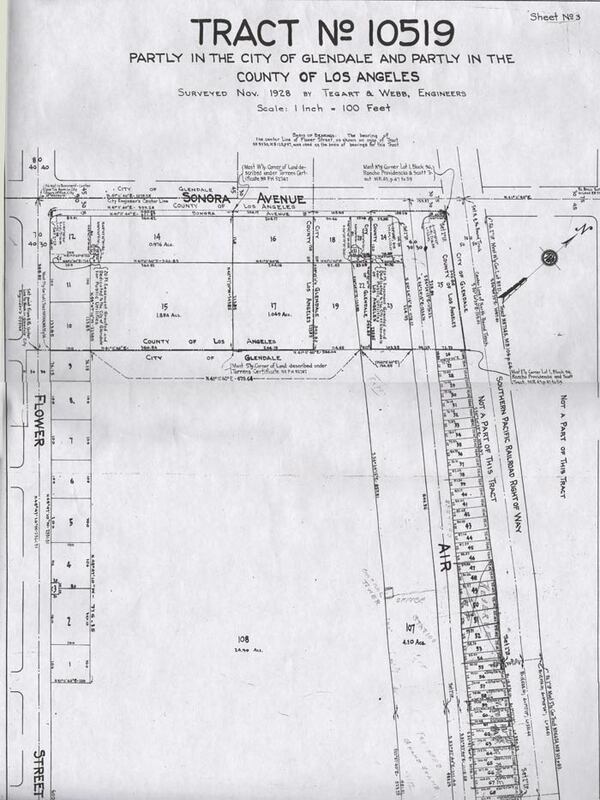 It shows the very northwest corner of the property with adjoining streets and the Southern Pacific Railroad right-of-way. Notice in the bottom third of this drawing, someone penciled in "control tower" and represented it with a small square. Next, below, six-months later, is the drawing from April 8, 1929. This drawing is oriented like the one above, with Sonora Avenue at the top. Featured in this drawing are the "passenger station," which became the terminal building with control tower attached. A grandstand, Pickwick Airways Hangar, Maddux Air Lines, Inc. Hangar, and Transcontinental Air Transport Co. Hangar are also labeled (you should be able to see these labels if you crank up your browser magnification a bit). Also paved taxiways and runways have been added to this version. Note the wind circle across from the Pickwick Airways Hangar. The dashed line at right depicts the Southern Pacific Railroad. Two months later, in June, 1929, the following version of this drawing was made. The draftsmen finally got out their "CAD" system -- Keuffel und Esser lettering templates, nib pens, India ink, French curves and T-squares -- and gave everything inked lines and formal labels. The Flying Club of California building was modified from the sketch above and aero industries, sales and support services locations were identified on this drawing. Focusing now only on the terminal building, below is an interior detail depicting half of the staircase leading to the dining room. This beautiful staircase still exists, as does the fan pattern on the archway over the dining room entrance. You may see them both in the photographs posted at the Grand Central Air Terminal page on the Davis-Monthan Airfield Register Web site. Further to the staircase and railing, the image, left, was taken on February 13, 2016 at the 60th annual meeting of the American Aviation Historical Society, which was held at the newly restored GCAT building. The scrollwork and the decorative tiles are clearly visible behind your Webmaster. The tiles are original and were carefully restored. The stairs led up to a dining area. The passenger terminal had two floors. 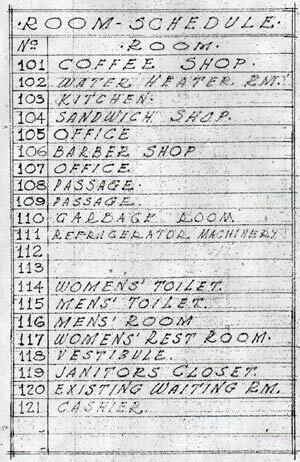 At right is the architect's Room Schedule for the first floor. The kitchen (Room Schedule 103) is shown below in two views from original Gogerty architectural photographs archived at the California State Library (CSL). Note the pot rack fashioned of pipe, and the serving trays in cubbyholes. Below, another view of the kitchen. This is an interesting view, showing paraphernalia of a commercial kitchen. Note the covered steam table, glassware stacked to the right, and what appear to be baskets with handles stored on top of the refrigerated cabinets (iceboxes?). The window is open; hopefully screened. The "Sandwich Shop" mentioned in the Room Schedule was the Cockpit Cafe, the entry for which can be seen in the background of the photograph below from the University of California Library Digital Collection (UCLA). The photograph also shows stage, radio, motion picture and (later) TV actor George Burns and his brother Willie Bernstein (who helped George write the Burns & Allen scripts for vaudeville, films, radio and, later, television), both in fedoras at center and left. Although they both resemble each other, I'd guess George is the person not X'd out. The caption for the photograph states, "George Burns (on left?) 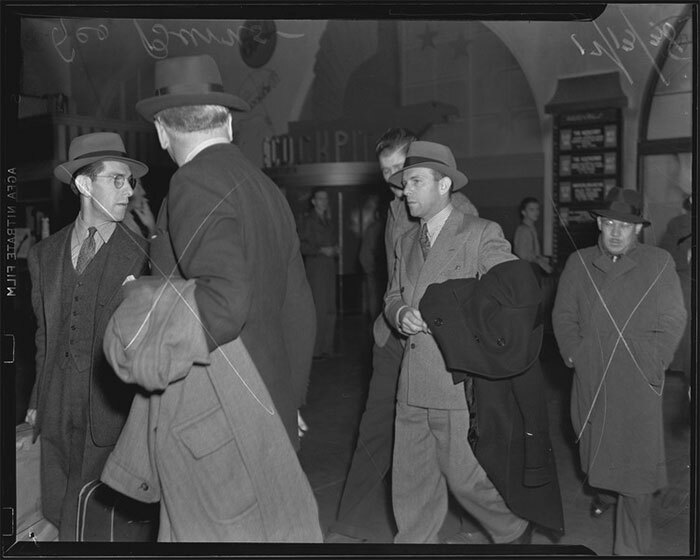 arriving at Grand Central Air Terminal with his brother Willie Bernstein. The event in the photograph is reported in 'Burns, Scowling, Returns Here; Comic Refuses to be Interviewed on Smuggling Confession,' Los Angeles Times, 12/14/1938." Further to the Sandwich Shop, another view from the CSL shows the layout of the individual Art Deco-design stools lining the lunch counter. More formal dining was on the second floor. Below, from CSL, a view of tables and chairs styled for the dining room. The wider view of the dining setting shows the Art Deco-themed ceiling and lighting. A view from farther out in the dining area shows tables on the other side of the room as well as the pronounced Art Deco skylight ceiling. The skylights were preserved during the restoration, but I was not allowed to photograph them. Notice the difference in design of the tables on this side of the room; four legs instead of a pedestal. The toilets were not specifically drawn out in any detail on the Terminal blue prints. You would think that these important rooms would be large and comfortable to serve the needs of tired travelers. 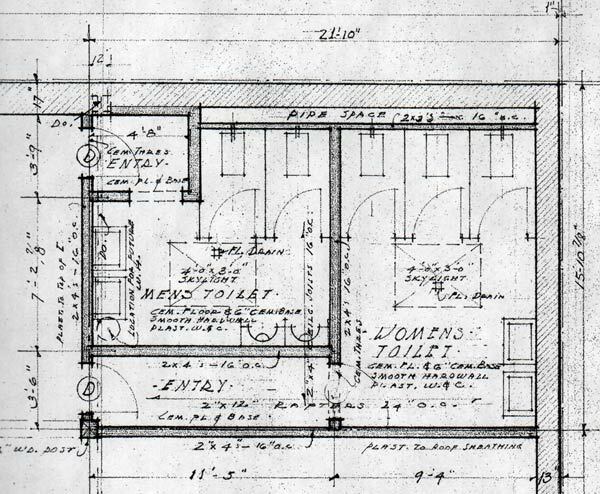 However, the drawings that detail the Irving Airchute Company's building on the corner of Flower and Sonora, did spec the bathrooms. Below is the drawing for their facility. Since most pilots and passengers of the smaller aircraft wore parachutes during that era, we can probably safely speculate that they visited these important rooms at one time or another. That there were two stalls and two urinals in the men's room and only three stalls in the women's, probably led to waiting lines for the women. Some things change; some things remain the same. Below, a view of the Irving building from the U.S. Air Services magazine, January, 1930. Note mention of Bert White as the western sales manager for Irving. White was a passenger with Davis-Monthan Register pilot Florence Lowe "Pancho" Barnes on Wednesday October 15, 1930. Bert White was a well-known stunt parachutist as well as an employee of Irving. Please direct your browser to Barnes' link to learn about the purpose of that harrowing trip. Stepping back from the engineering details, below, courtesy of G.B. Koontz, is an aerial photograph from 1929. The view is to the southeast and shows the site before full development of the aviation infrastructure surrounding the terminal and runways. Note the absence of the tower on the terminal, which is located left, center. Compare the terminal building in this aerial with the second one down at the link taken in 1930. The tower is constructed and operational on the terminal building. An interesting night photograph from the Gogerty collection at CSL is below. His view is from ground level, from behind the flood lights that lit the field. The direction of the view appears to be to the southeast, similar to the aerial view, above. Notice the intersection between the runway and the taxiway/ramp at the right side of the photo. The tower appears lighted and operational in this photograph. From the position of the taxiway and runway, the camera appears to be located at the far left side of the aerial shot above. Another aerial photograph of the field taken from this 1938 REFERENCE is below. The view to the north. 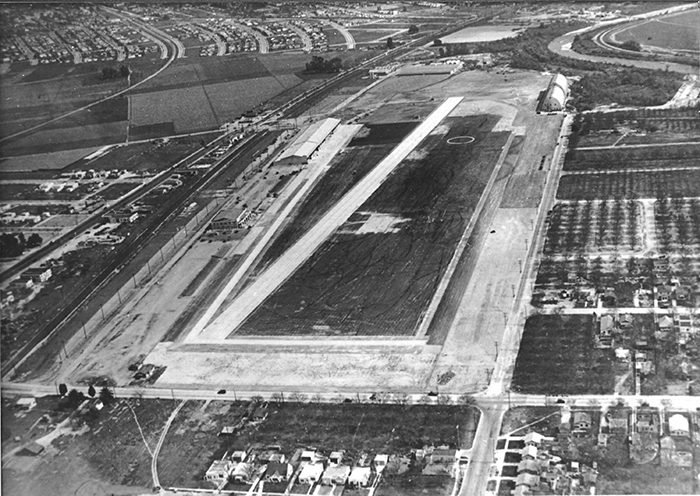 Note the proliferation of buildings on the east (right) side of the runway, and the absence of the two blimp hangars visible in the photograph above, top right. 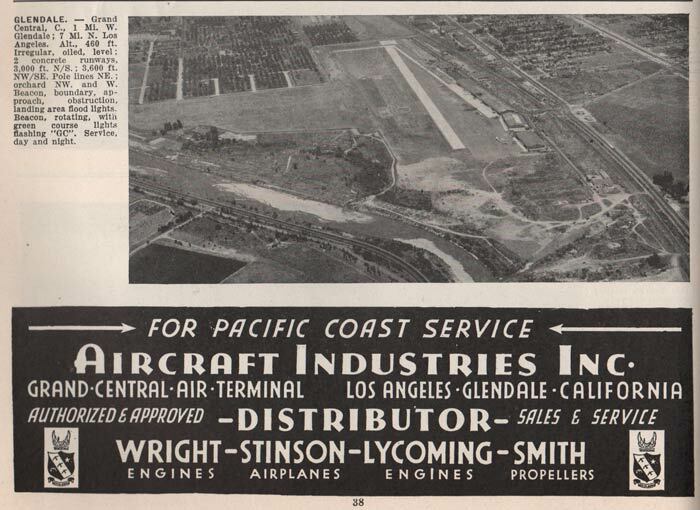 Back in the day, the airport was the home of many aviation-related businesses, one of which appears below, contiguous with the aerial photograph. Today, there are many Google pages and photographs of GCAT. It is pretty much surrounded now by housing and industry. Additional information and photographs are at the link. Soon after it formally opened, GCAT showed excellent business numbers. The unsourced article at left, ca. June, 1930, shows the top line figures for passenger travel for the first six months of the year. Another interesting figure in this article is the passenger loading described in the next-to-last paragraph. Compare the 91%-96% loads carried by TAT-Maddux to the approximately 30% passenger loads calculated for Standard Airlines just a couple of years earlier (PDF 670Kb). As well, GCAT was located in a busy urban area. Automobile traffic on the streets bordering the field were often treated to low-flying aircraft on approach to the runways just inside the fence. The article, right, describes a solution: a stop, look and listen sign. Besides scheduled passenger service and a vigorous private aviation population, once in operation, GCAT was a very busy place, hosting motion picture companies, various air shows and open house events for the general public and VIPs alike. The article at left describes average weekend crowds to be 10,000-25,000. Much of the activity was overseen by Davis-Monthan Register signer C.C. Moseley, the vice president and general manager for the Curtiss-Wright Flying Service. Moseley was also a director of Maddux Airlines. Pertinent to Moseley, through a series of negotiations GCAT became a property of the newly formed Curtiss-Wright Flying Service. Moseley, being a fresh manager with Curtiss-Wright, quickly became the dominant personality at Grand Central and would remain so for nearly four decades. By 1932, Moseley was the manager of the facility. Moseley was a colorful character on the west coast, well-known for his WWI service and management of the Grand Central Air Terminal during its Golden Age heyday and beyond. 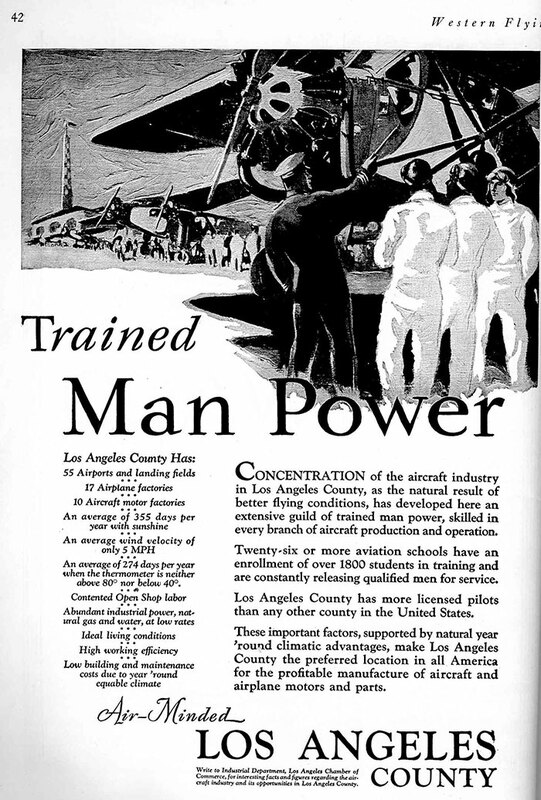 More broadly, the magazine advertisement, below, from the March,1930 issue of Western Flying, quantifies the aviation business dimensions across Los Angeles County. Below, as an example of weekend crowds cited in the article above, one event is captured by a long shot toward the southeast. It documents a TWA liner (NC13787, a Douglas DC-2-112, S/N 1297), and a Boeing 247 NC13308, S/N 1689. There is also visible a Curtiss Condor similar to the one in the next photograph down, a Mexican-registered Lockheed 10-E Electra, XA-BPE, and several other smaller planes. The Lockheed was manufactured in 1933, thus dating the photograph after that. Note the character of the terminal building's tile roof. The people stand 10 or so deep; there is a band seated with an audience at lower right. The shorts and kneesocks and bandanas on the band members suggest it is a Boy Scout band. There is a loudspeaker truck, and vintage cars, one of which looks like the courtesy car used to pull a trailer for passengers. Although the date of the photo below is unknown, the barbeque notice that appeared in Popular Aviation (PA), November, 1934, at right, would attract the same type of crowd. The donor of the photograph above conjectures that the scene, "... is the West to East TWA DC-2 inaugural service from Grand Central. We know this is a picture of a TWA Show because of the crowd, band, canopy, and the Douglas prominence in the composition Also I think the automobile is one of the 'Aero Cars.' My guess August 1 arrival or 2 departure,1934. "On May 18, 1934, the DC-2 production version of the DC-1 and forerunner of the DC-3 entered commercial service on TWA's Columbus–Pittsburgh–Newark route. On August 1 TWA started a three-stop transcontinental flight: leave Newark at 1600, arrive Glendale at 0700, fare $160 one way (approx $2,227 today). All transcontinental airline flights made at least three stops en route until 1946." 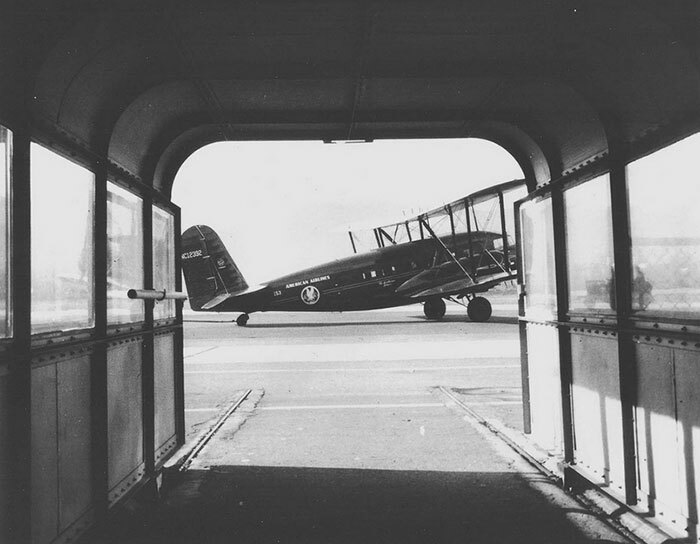 In the image above, you can see the covered walkway with striped awning that scheduled carriers provided for their passengers to walk through as they boarded their transport aircraft. Below is a photograph of what it was like for a passenger to walk through the canopy, circa 1934-1936. We can date this photograph, because Curtiss Condor NC12392 served with American Airlines from 1934-1936. Note the steel rails embedded in the ramp surface that allowed the canopy (on casters) to be moved forward and backward. An article from Popular Aviation, January, 1935 (PDF 2Mb) summarized the status of commercial air transport in the U.S. at the time. An American Airlines Condor appears in the article, which appears to be 12392 at GCAT. WHY BE INTERESTED IN MUSTY, OLD BOOKS? Each Register is a microcosm of Golden Age aviation history, recorded in the first-person, usually by the very actors who made that history. Study of Golden Age people in aviation points to an aerial “lifeway,” including shared values, clothing styles, politics, interests, vocabulary and perhaps even diets and social skills. Being a pilot in those early days was like belonging to an adventure-based brotherhood. But, men did not have a lock on camaraderie. The female pilots, although there weren’t as many of them, shared an equivalent sisterhood that, in many ways, was just as powerful as their male counterparts. That the women and their exploits were newsworthy at the time is made abundantly clear by the sheer numbers of newspaper and magazine articles and books published. As an example, in one small study I performed, The New York Times published 1,265 articles about female aviators during 1925-1936, an average of three a week. And that is just one newspaper and one small group of aviators. The machines flown were the best technologies of their time, and the pilots used them in some spectacular, innovative ways. Most of their craft lived hard, short lives. Only a very small percentage exist today, and they and their sister ships are featured on these Web sites. The aviation events they competed in (e.g. tours and races) and the records they set, sometimes preserved by entries in the Registers, served to test the mettle of humans and machines and to bring to a curious, and sometimes suspicious, public the opportunity to get close to pilots and their aircraft, and to learn about the utility of aviation in general. Whereas the Web is infinitely wide, it is many times only a few centimeters deep. Not so here. Each Register, and their associated Web sites, gives us an opportunity to dive into a deep, virtual pool of information to enjoy meeting the characters and hardware that shaped aeronautical science across the United States through the 20th and into the 21st century. Their influence is palpable today, and will be tomorrow, as we go to the planets and beyond. PLEASE NOTE: As of the upload date of this page, the Web site of the Davis-Monthan Airfield Register has been online eight years, since May 4, 2005. It presents over 15,000 pages of pilot biographies and other topics, which have been added incrementally over the years. The new sites have less content now, but they will grow over the coming years. Additions and changes to the sites are always posted at the "WHAT'S NEW ON THE SITE?" links on each site. Please bookmark the "What's New on the Site?" pages and come back regularly. All Web pages are designed by your Webmaster and implemented by The Web Professional, Inc., Naples, FL & St. Paul, MN. All Web sites are wholly owned, researched, written and operated by Delta Mike Airfield, Inc., a 501(c)3 non-profit education company based in Naples, FL, USA. Unless otherwise noted, all designs and original texts and images are Copyright © Delta Mike Airfield, Inc. The mission of Delta Mike Airfield, Inc. is education, encouragement and support of historical aviation research and multi-media publication to enhance knowledge among public and private sectors around the globe. Specific emphasis is on the Golden Age of Flight, nominally between 1920 and 1940. The company operates primarily, but not exclusively, through its Web sites. Other mixed media publications and public appearances also support the Company. Your donations can be made through the PayPal portal on any of the Web sites. NOTES ON THE RESTORATION OF THE GRAND CENTRAL AIR TERMINAL As mentioned, the GCAT is restored and open for visitors. The Flickr stream of restoration progress was posted above. The 60th annual meeting of the American Aviation Historical Society (AAHS) was held at the newly-restored building on February 12-14, 2016. Your Webmaster attended. Some photographs follow. First, the restored tower observation window. Why should we care about this window? Because it is the original window, including the glass and frame, installed in 1929. Every last one of the thousands of entries you see on the Register pages exhibited on this Web site was written by a tower Operator who viewed the airplanes and people through this window, which overlooked the runway and ramp. Because of structural issues (stairway not restored), it was not possible for me to climb into the tower to photograph the view out. Below, a wider view of just the tower. Three of the Deco-themed, winged pilots can be seen in this view. Notice the Art Deco accents on the building exterior. Wider still is this view of the entire building from the runway side. Vintage automobiles were on display and people in period clothing mingled with meeting attendees. This view is from approximately the runway location. The architect in charge of the restoration spoke at the AAHS conference. He was impressive in the care that he took to restore this building. Paint layers were removed one at a time to get to the original paint. Those pigments were reproduced and applied to walls and exterior. The colors you see in these photographs are historically true. He spoke of leaving some of the broken trim details unrestored, so that visitors could get a feel for the age and use the building has endured. An example of spalled concrete trim that is unrestored is at right. Inside the main terminal (the architect's Room Schedule 120) was a reasonable compromise between accurate restoration and modern necessities. For example, the chandelier at left is an accurate reproduction of the original.The chandelier is surrounded by flush-mounted, modern recessed lighting fixtures that were not in the 1929 building. Neither was the mount for a video projector seen at lower right. The architect spoke of the care that was used to remove layers of paint from the decorative tiles so that they could shine again as new.The tiles were carefully preserved on stair risers and walls, below. 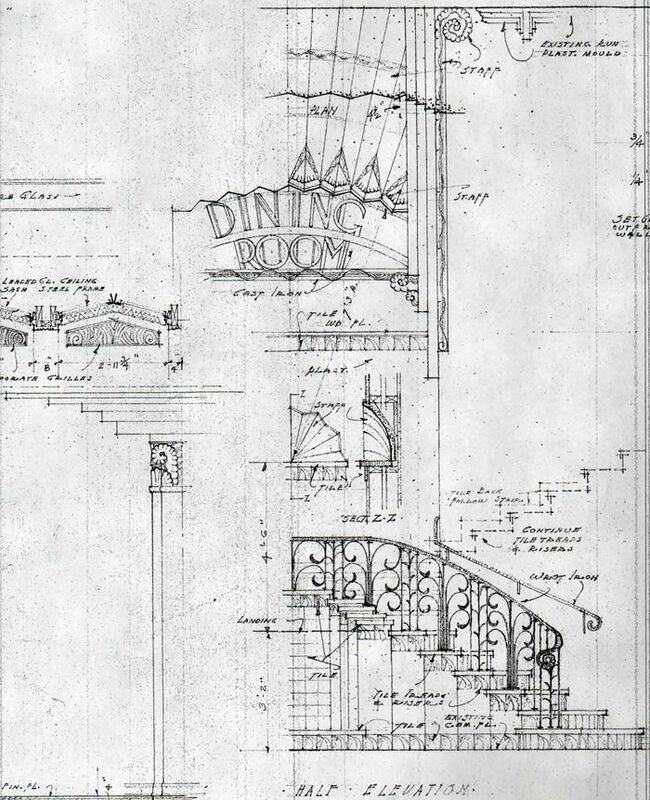 And the railings, below, while not original, were manufactured new following Gogerty's designs on the original architectural drawings (see above). Notice the sign over the landing at the back of this photograph. It is a sign painted on the wall advertising the Curtiss Wright Technical Institute of Aeronautics, below. It is an example of the careful and painstaking removal of paint layers while preserving this original, hand-painted sign underneath. It was left as it was found and not retouched. The original staircase, from from the Gogerty photos at CSL, is pictured below. This photograph was taken before the Curtiss-Wright sign was painted. Notice the penny scale at far right. Peeking through the doorway on the second level is light coming through the skylights on the dining room ceiling (see the Gogerty photo of the dining room, above). A balcony view, taken in 2016 from the first floor at the top of these stairs, is below. The Art Deco sconces, coves and accents are striking. Refreshments were set up for the meeting. Below is approximately the same view taken from the first floor, ca. 1930. The balcony, clock and sconces remain true (notice that the photos were taken withing a half-your of each other), however the contemporary refreshment station was the 1930 ticket counter with decorative grills. A detail photograph of the 1930 decorative grill work is below. The restoration project includes a visitor's center which displays artifacts of the old GCAT found during restoration. The artifacts include a chair from C.C. Moseley's office, a flood light (similar to the ones operating in the nighttime photograph above), letters and a bound copy of the 212 Register pages found in the tower cupola, the same ones the Walt Disney Company shared for us to use on this Web site. The pages in the visitor center are plastic-coated and can be thumbed through by Disney guests. No photography was allowed in the visitor center when I was there.